Description: Sexes similar. Short, thin black bill that is slightly decurved. Greenish-yellow legs. 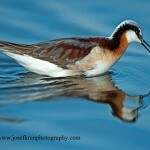 Breeding plumage is dark brown above; light brown breast with heavy streaking; and white belly. Wing tip does not extend beyond tip of tail. 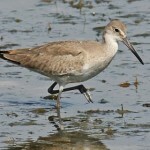 Winter plumage is duller and shows a prominent brown breast band. Juvenile is similar to breeding adult but lacking heavy streaking on breast. 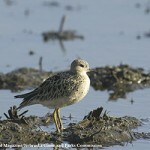 Habitat: Migrants frequently gather in groups on mud flats, shallow ponds, marsh edges, and flooded meadows. Usually will forage well away from the other larger “peeps”. Where in Nebraska: Common spring and fall migrant across the state, but less common in the west. 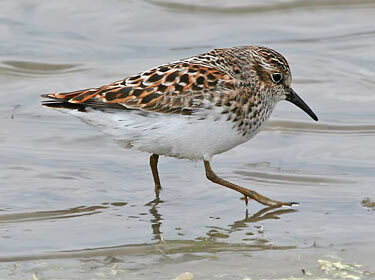 Fun Facts: The Least Sandpiper is the smallest shorebird in the world.